Submit a tip or contact us! For SEOs, links are very important part of any SEO strategy for all websites. However it can be a pretty geay area for site owners to request links, especially when those links are in exchange for something else, such as content or money. And for the most part, those are pretty clearly a violation of Google’s Webmaster guidelines. 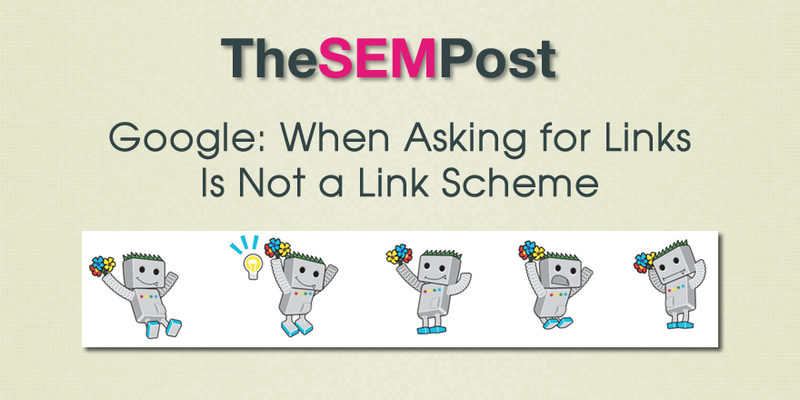 Danny Sullivan from Google made many comments yesterday about link building through content published on other sites that is pretty relevant for most SEOs, especially since requesting links are in that grey area. According to Sullivan, there’s still plenty of room to request links without having any negative implications from Google. It was brought up on Google specifically about link schemes and whether content creator wanting follow the links from any site that republishes the content, if that would be okay or not. Because as both John Mueller and Gary Illyes from Google have often said, if you’re in a situation where you’re asking for a link, that probably isn’t a natural link and could be a webmaster guidelines violation. But, according to Sullivan, asking for a link is fine. First, here is how Google describes a link scheme in the context of articles. “Any links intended to manipulate PageRank or a site’s ranking in Google search results may be considered part of a link scheme and in violation of Google’s Webmaster Guidelines.” Most people giving free content for links are not doing it from the goodness of their hearts – they are mostly doing it for links. Yes, there are some that do want the exposure or traffic, but those are from very well known sites in those markets, and the reality is more and more of them are either refusing to link or nofollow those links so they do not run into problems with linking to lower quality sites or sites they don’t necessarily want to vouch for. First fall under “buying or selling links that pass PageRank”, and yes exchanging a piece of content for that link falls under this. Yes, a free piece of content could be considered “goods or services” when it is republished for the links. Then there’s also the specific link scheme for article marketing. Here is what Sullivan said. I'd leave it to someone like @JohnMu to say better — and he's away right now — but it's probably OK depending on how it is done. For example, if you asked for canonical back to your own site from your own content, I can't see an issue there — and that's kind of a link…. Now in theory, this would refer to sites like Reuters or Associated Press. But the majority of those articles republished don’t have links back to the original source, although they do often cite the news service the article came from. Then there are sites like Medium, where the content is often republished from other sites, such as personal blogs. Writers import their content that has been published previously, and Medium automatically includes the canonical to the original source. Google does include info on linking and syndication in their help documents as well – but with no mention specifically of canonicals and also without mention of nofollow. Syndicate carefully: If you syndicate your content on other sites, Google will always show the version we think is most appropriate for users in each given search, which may or may not be the version you’d prefer. However, it is helpful to ensure that each site on which your content is syndicated includes a link back to your original article. You can also ask those who use your syndicated material to use the noindex meta tag to prevent search engines from indexing their version of the content. Something also important to consider here is that canonicals are only a suggestion, not a definitive, so content could possibly outrank the original, especially if it is just with a regular link and not a canonical. Note that even you you explicitly choose a canonical page, Google might choose a different canonical for various reasons such as performance or content. There are many sites that carefully vetted any content they publish on their sites. There are many who don’t, and are looking for the free content instead, regardless of it is been published before not. In the first example, it is specific to syndication and canonicals. But the conversation quickly moves on to more general links for content discussions. If you said here's my content, but it's a copy of what I wrote over at this other place, and please link to that straight. Probably fine as well. Probably fine if you even said please link using the same headline or whatever…. Now, this isn’t a canonical link that he is describing but a regular link. And linking with the same headline – considering keywords are often in the headline, that is instant rich anchor text for an article. Sullivan even took it a bit further that if you’re sharing contents and you’re making a link back a requirement for publishing that content, he also agrees that’s perfectly fine. With all the context I said earlier on perspective and intent, yes, I think that's fine. I wrote an article; please link to me is not alone a link scheme. I wrote and article and you must link with these exact words or provide these X number of links, more worrisome…. Again, nuance and perspective. You want to say someone should link to you for a unique work in a single license agreement, that's not much of a "link scheme." You do that with the same work over and over again, now it's feeling like you have a different intent than fair credit. But where is the line drawn between a link scheme and a mere link campaign in exchange for content, specifically syndicated or otherwise? There is a reason why Google has discouraged the practice of guest blogging for links for years. As always, I'd beg people to actually understand the nuance, that it's not binary situation. The intent is going to be important. My inbox is flooded by people who offer me posts in exchange for "one simple link." That's almost certainly going to be a link scheme…. That's because even though it's "one simple link" it's part of a campaign designed really just to get links. Similarly, the more someone is really specific and demanding about what exactly a link should have as anchor text, the more it's like "um, so you're doing this to rank?".. Sullivan also talks a lot about intent, and he feels that site owners should not be afraid to ask for a link. He says the difference is when it is moving into whether you want the link for content just to help rank, but unless it is an extremely well known and respected publication, it’s extremely likely that someone wants that link for the SEO value and not just the traffic. I don't think people who create content should be afraid of asking for a link. But the more it's positioned as a demand with specific, the more it starts to tip to "are you doing this just to rank." And the more wary it might make publishers. Now, even with Sullivan’s comments, algorithms are algorithms and they may not necessarily differentiate between what is a legitimate link exchange for content republication and what is simply what we know as being a guest post. Because even as Sullivan describes as, they can definitely be one and the same. With how Penguin works, these types of links might be discounted automatically, meaning a lot of work for links you think should be legitimate as how Sullivan describes, yet give no link value at all. And you also need to think about link related manual actions. Will a person a Google who is handing out manual actions for links know if the links are gained legitimately as per how Sullivan describes or not? Because even if you feel you are in the clear according to Sullivan, a manual action for links can still result in a significant loss of traffic and potential revenue for a site, not to mention the time for a reconsideration request to be reviewed, and you might still end up with the manual action if the reviewer doesn’t agree with your view on those links. It also could open you up to competitors filing spam reports for these types of links. Because it is hard to tell whether they should be considered legitimate or not. It is odd that Sullivan makes no mention of using nofollow. If you are asking for a link, it is not natural, according to both Mueller and Illyes, and it should be nofollowed. In other words, if you want to play it safe and not worry about any potential manual action, nofollow it. But there is no mention of it in any of the tweets. So this whole situation raises more questions than it answers for many SEOs. And suddenly, guest blogging, especially if you call it syndication, seems be back on the menu for a legitimate way to build links because suddenly that grey area seems not so grey anymore. Jennifer Slegg is a longtime speaker and expert in search engine marketing, working in the industry for almost 20 years. When she isn't sitting at her desk writing and working, she can be found grabbing a latte at her local Starbucks or planning her next trip to Disneyland. She regularly speaks at Pubcon, SMX, State of Search, Brighton SEO and more, and has been presenting at conferences for over a decade. I'm very glad you have chosen to leave a comment on my humble site. Please keep in mind that all comments are moderated according to my official commenting policy. Please Do NOT use keywords in the name field because they won't be linked to anything anyway...just use your real name. Let's try to have a personal and meaningful conversation. Sign up for our daily news recap & weekly newsletter.